UPDATED: They listened to your complaints! Check out the revised menu screens in our Summer 2018 review. EVEN BETTER: More changes in our August 2018 update. 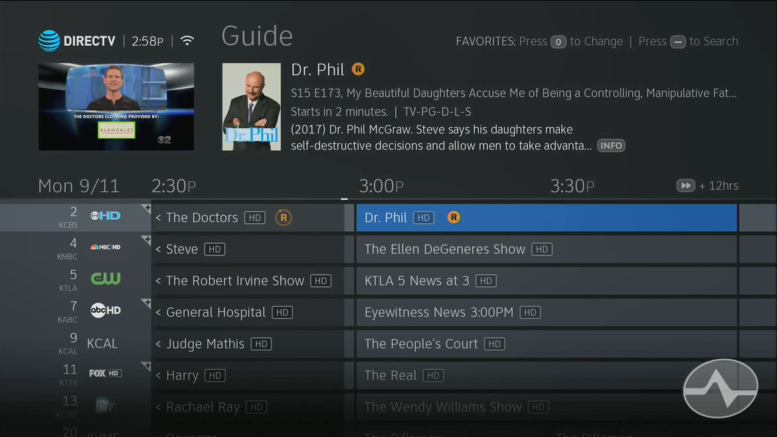 If you have a Genie DVR (except the first generation HR34 Genie) you’re about to have a whole new experience. All the screens and menus have been updated and they look a lot more contemporary, as you can see in the picture above. It’s not just the colors and shapes that have changed – there’s a new emphasis on the basics. Casual users will find it easier to search, easier to set up recordings across multiple channels, and easier to find something to watch without diving too deep into menus. The new interface uses pictures instead of words whenever possible and that should make for a more immersive experience. The menus and button assignments are designed to work with the Genie Remote, and that’s meant some things have moved. What’s interesting is that those kooky cats over at the Edgecutter Forums, who do a lot of AT&T’s pre-release testing, aren’t so happy about the new menus. Seems they were disappointed that some power-user-friendly features changed, and for them that means it’s worse than the old one. Personally, I would have liked to have seen some changes that I didn’t see, but I think for the 24 million or so people who use DIRECTV satellite service every day, it will be a welcome visual change and they’ll appreciate the new stuff more than they miss the old stuff. The new menus will be rolling out to HR44, HR54 and Genie 2 (HS17) users throughout the rest of 2017. I don’t recommend that anyone try to force a download onto their systems. It will come when it comes, and this is a slow rollout to try to make sure that there aren’t any issues that need to be fixed. Throughout the next few months, we’ll be producing videos to help you get the most of the new menus as well. In the meantime, you can get a great glimpse of the new menus by reading our exclusive review in PDF form! Be sure to zoom in on all the images to get a great idea how the new menus look and perform!